Amar Singh made it amply clear that he liked the leadership of PM Modi and now his entire life was dedicated to him. LUCKNOW: Rajya Sabha MP Amar Singh might not have made his intentions to join the BJP public but his actions and statements are self-explanatory. However, he did not mince words in putting all the speculations of him going to back to the Samajwadi Party to rest in Lucknow when he had come to attend UP government's ground breaking ceremony of 81 development projects. Moreover, Amar Singh made it amply clear that he liked the leadership of PM Modi and now his entire life was dedicated to him. Amar Singh, flanked by Bollywood producer-director Boney Kapoor, grabbed the eyeballs while basking in quintessential saffron at the ceremony. The former SP leader and now unattached RS member came under the media spotlight when PM Modi pointed at him and referred to him during his speech at the ceremony. The PM, while launching a salvo at opposition for its insinuations over his (Modi) proximity with industrial houses, had said that many politicians may show aversion to corporate houses in public but they had enjoyed their hospitality behind the curtains. "Amar Singh sitting here must be knowing it the best. He has the history of such leaders playing with industrialists behind the curtains," the PM had stated in a veiled reference to SP and Congress leaders. 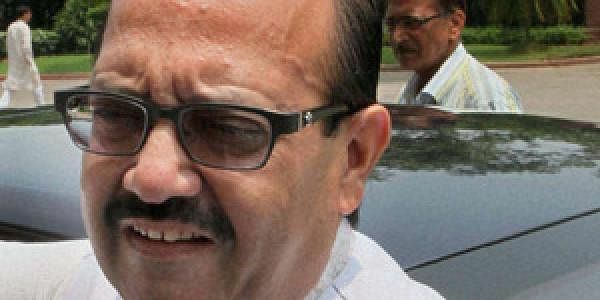 Amar Singh had reciprocated to PM by folding his hands and a grin in agreement. As per the highly placed sources, after the event PM Modi met Amar Singh and had a brief discussion with him. The PM's mentioning of his name and then a brief chat suddenly catapulted former Samajwadi Party General Secretary into limelight in the saffron camp. Later, Amar Singh met CM Yogi Adityanath at his 5 Kalidas Marg residence triggering speculations. However, when asked, Amar Singh claimed that as and when he would intend to join the BJP, he would make it public openly through a press conference as he was a Rajput who had the grit to accept what he did. "Right now, I want to say that I like Narendra Modi and I will keep supporting him." Notably, after his second and the most unceremonious exit from Samajwadi Party after being expelled by Akhilesh Yadav on January 1, 2017, Amar Singh made attempts to meet Mulayam Singh and seek his support but even MSY could not muster courage to go against his son, cousin Ram Gopal Yadav and Azam Khan. Even Mualaym Sigh Yadav was also dislodged on the same day by Akhilesh who had taken over as party president in coup of sorts. As Amar Singh himself puts it: "Then Mualaym Singh ji asked me to come from the back door in the darkness of night so that no party leader came to know about it and I refused to do so." In fact, after that Amar Singh tried to make inroads into the Congress party but was believably turned away by 10, Janpath. Since then the former SP leader has been publicly lauding the PM and his government's policies and development plans. However, the BJP sources claimed that the party was utilising Amar Singh's services in bringing investment to the state owing to his closeness with country's top industrialists. "He may also play important role in exploring ways to keep the SP and BSP away from forging an alliance in UP," said a leader on anonymity.